The Rockhurst University community is continuously evolving as seniors graduate, freshmen arrive, and sophomores and juniors continue on. However, there is no doubt that some students, some faculty, and some organizations create a lasting change to this campus.Active Minds falls into this category. In 2016, my sister, Tori Zanaboni, noticed a need on campus for more conversation about mental health. Instead of staying silent in the face of a challenge, she approached it head-on. Tori, along with Gracy Kubicki and Jack Reid, gifted the campus and students like me with a chapter of Active Minds. Active Minds is a national organization whose mission is to empower students to start conversations about mental health, break the stigmas surrounding mental illness, educate, and encourage help-seeking. A student from the University of Pennsylvania named Alison Malmon founded Active Minds when her older brother, Brian, died by suicide in 2000. Because of the stigmas surrounding mental illness, he hid his symptoms of psychosis and depression for years. Alison was determined to create an environment where students feel comfortable to share their struggles and find help. Soon afterward, the organization Active Minds Inc. was created. The Rockhurst community has been supportive of the new Active Minds chapter since its origin. What students find so intriguing is that the goal of Active Minds is not to gain anything, but rather to help create an environment of openness and conversation on our university’s campus. It is the inherent values of inclusivity and hope, which Active Minds preaches, that draw people to it and make them want to get involved. In just a few years, Active Minds has encouraged faculty, students, and staff to talk more about mental health in their day-to-day lives. In fact, student Gretchen Boxdorfer (’19) suggests that “people are more comfortable asking for help when they need it now that Active Minds has started to de-stigmatize mental illness.” People are now more accepting of these conversations than ever before. Photo is featured courtesy of Rockhurst Active Minds. The Rockhurst University chapter strikes up these conversations about mental health on campus by hosting a variety of speakers, chapter meetings, awareness weeks, and tabling activities on campus. 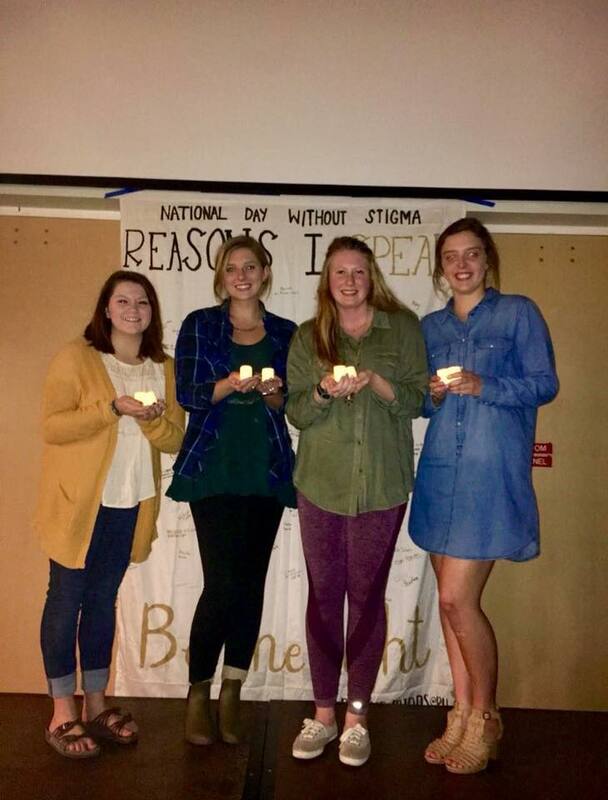 One of the favorite and most impactful programs is “Be the Light,” an event where four students give testimonies about their own mental health journeys. The speakers,ranging from a senior fraternity president to a brand new freshman, show all of those in attendance that mental health is no different than physical health and that it must be regarded in the same esteem. The acts of courage that these students display undoubtedly break the silence that most people wield to protect themselves against the stigmas of mental illness. I most notice the change that Active Minds has created in the small ways. It is much more likely for me now than it was before Active Minds to hear a casual conversation between two students asking one another about how they are coping with stress or sharing ideas on how to take “mental health breaks.” The change is also noticeable in big ways, such as updating the student ID cards to include the national suicide prevention hotline and Rockhurst security and Rockhurst counseling center phone numbers. Because of these changes, Abby Mason (’20) believes that Active Minds “has helped normalize mental illness, creating a safe place full of respect, understanding, and acceptance.” Our goal is that one day building this safe environment and continuing these positive conversations about mental health will be so natural that an organization such as Active Minds is no longer even needed. ir own mental health journeys. The speakers,ranging from a seniorfraternity president to a brand new freshman, show all of those in attendance that mental health is no different than physical health and that it must be regarded in the same esteem. The acts of courage that these students display undoubtedly break the silence that most people wield to protect themselves against the stigmas of mental illness. I most notice the change that Active Minds has created in the small ways. It is much more likely for me now than it was before Active Minds to hear a casual conversation between two students asking one another about how they are coping with stress or sharing ideas on how to take “mental health breaks.” The change is also noticeable in big ways, such as updating the student ID cards to include the national suicide prevention hotline and Rockhurst security and Rockhurst counseling center phone numbers. Because of these changes, Abby Mason (’20) believes that Active Minds “has helped normalize mental illness, creating a safe place full of respect, understanding, and acceptance.” Our goal is that one day building this safe environment and continuing these positive conversations about mental health will be so natural that an organization such as Active Minds is no longer even needed. Mia Zanaboni graduated in May 2018 from Rockhurst University with a nursing degree. She served as president of the Rockhurst Active Minds chapter and was a member of the women’s varsity soccer team and the sorority Alpha Sigma Alpha. She recently began her career as a pediatric nurse at St. Louis Children’s Hospital.